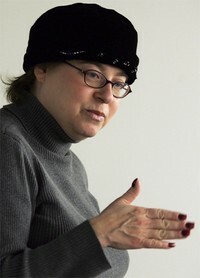 Deborah Y. Cohn, PhD, during a recent class at Sy Syms School of Business. Dec 28, 2004 — The Direct Marketing Day Foundation, Inc. honored Deborah Y. Cohn, PhD, assistant professor of marketing at Yeshiva University’s Sy Syms School of Business, with its DMDF Professor Award for 2004. Dean of Sy Syms School of Business, Charles Snow, PhD, said the award is a source of pride. The Direct Marketing Day Foundation (DMDF), based in New York City, is an independent nonprofit corporation serving the direct and interactive marketing community. Its mission is to provide funding to educators for resources and scholarships to introduce students to careers in direct marketing. DMDF supports direct and interactive marketing programs at the college and university level.